(SRS) AIR BAG” and SEAT BELT PRE-TENSIONER” 3, sQUEAK AND RATTLE TROUBLE DIAGNOSES 5, dUPLICATE THE NOISE AND TEST DRIVE 6, lOCATE THE NOISE AND IDENTIFY THE. 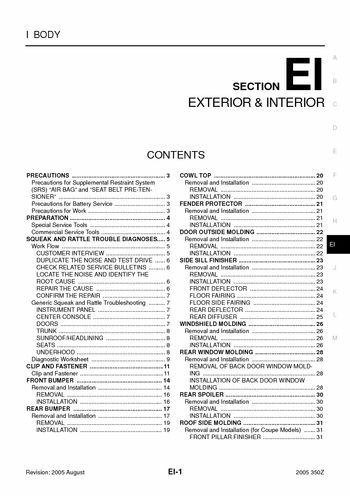 Generic Squeak Rattle Troubleshooting 7, rEMOVAL OF BACK DOOR WINDOW MOLDING 28, removal and Installation (for Coupe Models) 31, removal and Installation (for Roadster Models) 32. Removal and Installation (for Coupe Models) 35, removal and Installation (for Roadster Models) 37, removal and Installation (for Coupe Models) 39, removal and Installation (for Roadster Models)41. Removal and Installation (for Coupe Models)44, removal and Installation (for Roadster Models)45, tRUNK ROOM TRIM & TRUNK LID FINISHER48, removal and Installation (for Roadstar Models)48. Precautions for Supplemental Restraint System (SRS) AIR BAG” SEAT, the Supplemental Restraint System such as AIR BAG” and SEAT BELT PRE-TENSIONER”, used along, with a front seat belt, helps to reduce the risk or severity of injury to the driver and front passenger certain, system uses the seat belt switches to determine the front air bag deployment, and may only deploy one front. Air bag, depending on the severity of a collision and whether the front occupants belted unbelted, information necessary to service the system safely is included in the SRS and SB section Service Manual, to avoid rendering the SRS inoperative, which could increase the risk of personal injury death, improper maintenance, including incorrect removal and installation of the SRS, can lead to personal injury caused by unintentional activation of the system. Do not use electrical test equipment on any circuit related to the SRS unless instructed, before disconnecting the battery, lower both the driver and passenger windows, window slightly raises and lowers automatically to prevent any window to vehicle interference, window function will not work with battery disconnected. After removing and installing the opening/closing parts, be sure to carry out fitting adjustments check, check the lubrication level, damage, and wear of each part, the actual shapes of Kent-Moore tools may differ from those of special service tools illustrated here, sQUEAK AND RATTLE TROUBLE DIAGNOSES. Interview the customer if possible, to determine the conditions that exist when the noise occurs, nostic Worksheet during the interview to document the facts and conditions when the noise occurs any, customer's comments; refer to EI-9, "Diagnostic Worksheet", conditions that exist when noise occurs. Obtain all the facts and conditions that exist when the noise occurs (or does not occur), if there is more than one noise in the vehicle, be sure to diagnose and repair the noise that customer, after identifying the type of noise, isolate the noise in terms of its characteristics, are provided so the customer, service adviser and technician are all speaking same language when. Squeak —(Like tennis shoes clean floor), squeak characteristics include the light contact/fast movement/brought on by road conditions/hard surL, faces=higher pitch noise/softer surfaces=lower pitch noises/edge surface=chirping, creak—(Like walking on an old wooden floor). Creak characteristics include firm contact/slow movement/twisting with rotational movement/pitch, dependent on materials/often brought by activity, rattle characteristics include the fast repeated contact/vibration similar movement/loose parts/missing, knock —(Like a knock door). Knock characteristics include hollow sounding/sometimes repeating/often brought by driver action, tick characteristics include gentle contacting of light materials/loose components/can be caused by driver, thump characteristics include softer knock/dead sound often brought by activity, buzz characteristics include high frequency rattle/firm contact. Often the degree of acceptable noise level will vary depending upon the person, judge as acceptable may be very irritating customer, weather conditions, especially humidity and temperature, may have a great effect noise level.